Body Weight: Body mass highly variable with seasonal moult. Range: Endemic to Africa. Inhabits coastal shores and islands off Africa's southern cape, with populations in the countries of South Africa and Namibia. Habitat: On land, found on low-lying, rock-strewn islands and more recently established mainland colonies. At sea, to within 50 km or more from islands or within 15 km of the mainland. Decreasing population trend. 60% decline during the 2000s. Locomotion: On land, walks upright, with a straight-backed gait; flippers held away from the body, hops over small rock gaps and slides down large inclines. At sea, efficient swimmer; uses wing strokes to move the body. Steers with tail, feet, and wings. Travels quickly while porpoising (c. 12km/hr). At the water surface, head and back are visible and tail is held level with water surface. Overall speed during foraging trips 3.5-6.3 km/hr. Dive to forage; flippers held to sides; commonly reaches depths between 15 and 23 m; submerged between 87 and 275 seconds. Activity Cycle: Most adults leave colonies around dawn, swimming out to forage; one adult remains with eggs and chicks at all times. Foraging adults usually remain at sea until late afternoon or dusk. Courtship and mating frequently occurs at dawn and after dusk, although is not restricted to these times. Nest building is carried out during the day. Social Groups: As with other penguins, forms large colonies for breeding and resting. Allopreening on land believed to reduce aggression. May synchronize foraging when in small groups at sea. Diet: Consume pelagic fishes across a range of sizes; primarily anchovy and pilchard. Take squid and at least 15 other fishes; rarely crustaceans. Some evidence for seasonality in the diet. Undergo regular fasting for up to 18 days during molt. Predators: Various animals; commonly fall prey to Cape fur seals. Gulls, ibis, snakes, and cats prey on eggs and chicks. Sharks may take individuals at sea. Breeding Season: Prolonged; records of breeding in most months at multiple sites. Sexual Maturity: Most first reproduce at four years of age; may be as early as two or as late as seven. Courtship: Complex courtship displays performed by male and female; includes behaviors such as bowing and embracing. Nest Construction: Three primary forms: burrows, surface scrapes, and covered nests, most lined with collected materials. Burrows are the traditional nest type. Egg Characteristics: First laid egg generally slightly larger than the second; 54-76 mm x 47-55 mm, 99-118 g. Color is chalky, white. Incubation and Care: Incubation lasts 38-41 days. Incubation and feeding undertaken equally by parents; most shifts last 1-2 days. Food is provided by the adults until shortly before the chick fledges. © 2013-2019 San Diego Zoo Global. Updated August 2015. Population estimate updated Apr 2019. 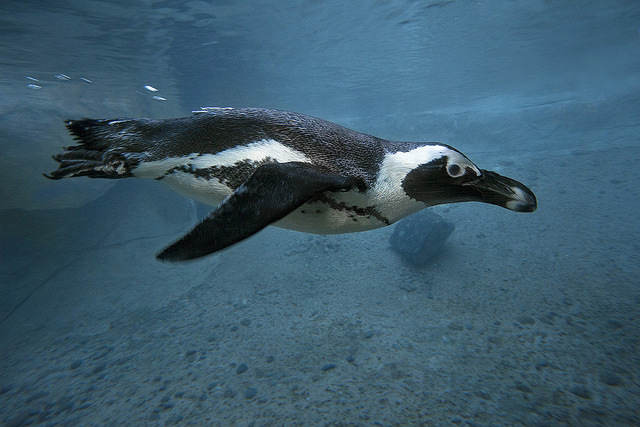 How to cite: African Penguin (Spheniscus demersus) Fact Sheet. c2013-2019. San Diego (CA): San Diego Zoo Global; [accessed YYYY Mmm dd]. http://ielc.libguides.com/sdzg/factsheets/ africanpenguin/home.